Almost five years ago, the comandante presidente created the National Circus Company, as a part of his cultural policy. 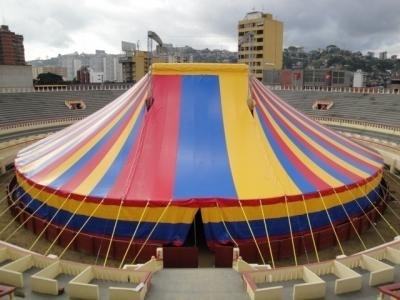 A year and a half later, the Company set its tent inside the historical Nuevo Circo, Caracas’s historical bullrink, and a spot for major political rallys back in the day. This week, the future of the CNC was left in the air after most of its members resigned. They’re not giving up the circus life, but instead they setting up a new national circus school. However, their split with the Culture Ministry bring some questions to mind: Why they quit then? Why the school couldn’t be created as a part of the company’s structure? Looks like the CNC didn’t have enough autonomy to do its work, including the lack of an annual budget. The payroll was transferred earlier this year from the Ministry to Misión Cultura, an internal foundation which looks more like a whole parallel ministry. The Chavernment continues to present itself as the champion of culture in Venezuela. Right now, there are TV spots of something called the National System of Popular Culture, which is a part of Mision Cultura (itself a part of the Culture Ministry). In short, there are like three Culture Ministries working today in Venezuela. I must admit the idea of a circus school and company is not bad: They avoided animal acts, done by commercial circus companies and its work of bringing some joy and laughter to kids and adults all around the country (in small towns, schools or hospitals) is something more valuable than spending a lot of money in a soap opera that few people are watching. Last but not least, a circus school and company could be a decent way out for all those jugglers, clowns and flame-throwers you can see in many Venezuelan streets today performing for little money. Isn’t better than those people who want to live of their craft have a chance to make it in a legal and safe manner, instead of ending up in deep trouble?